A record 100,000 revellers have been in Newquay over the weekend for the annual Run to the Sun festival. 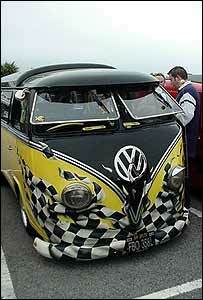 The event, which started life as a meet for Volkswagen enthusiasts, has grown in popularity over recent years. The event is entering its 16th year and has become one of the UK's largest custom car festivals. Organisers say there are many different elements which contribute to its unique image, not least of all its location in "surf capital of the UK", Newquay. Spokesman Chris Christopheros said: "It all started a long time ago with a group of custom car enthusiasts who were interested in surfing as well. "Then the whole thing gelled together, with surfing, the clubs, and of course the Show 'n' Shine." That is where all the owners got the chance to show off their machines, with about 6,000 vehicles entered into Sunday's show. One owner said: "There's a real mixture of people and a great atmosphere. "There's nothing else like it really." Police in Newquay said the Run to the Sun passed off without any major incidents.